Brian is CEO/Founder of SEEN and has spent his career building and fundraising technology companies and startup communities. The SEEN software platform and services help top consumer brands and agencies build and engage audiences on visual channels like Instagram, Twitter and more. Aside from his efforts on company building, Brian has been a key advocate in the Columbus and Midwest startup ecosystem. Brian founded WakeupStartup, a monthly event held in Columbus that provides a free platform for entrepreneurs to pitch to an audience of community members. 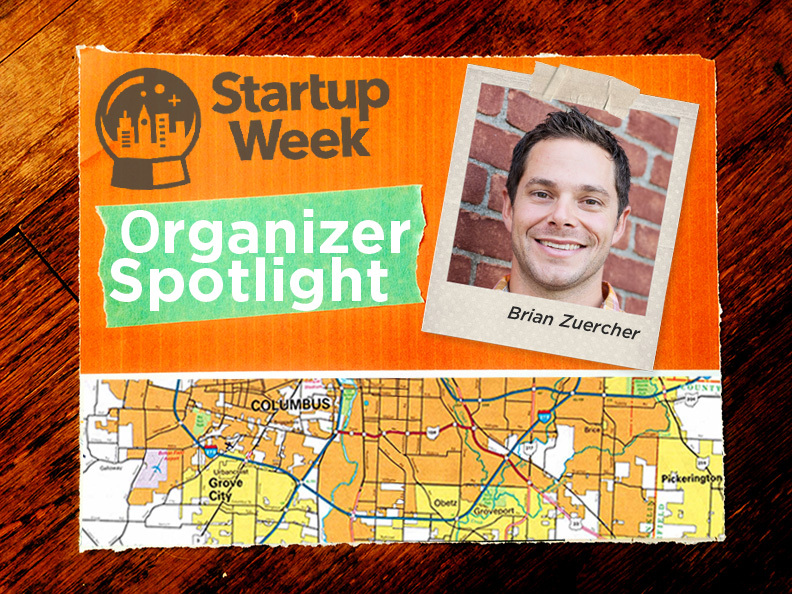 Next up in our Organizer Spotlight series is Brian Zuercher, lead organizer of Columbus Startup Week. I had the pleasure of meeting Brian last year when he helped organize Columbus Startup Week as a core organizer. His energy was infectious and you could see just how passionate he was about the Columbus entrepreneurial ecosystem. Brian was gracious enough to take some time out of his busy schedule to tell us his thoughts on organizing Columbus Startup Week and why it was important for his to take on the lead role this year. How did you get involved in the Columbus startup community? In 2008, I moved to Columbus and one of the first things I did was attend Columbus Startup Weekend. It was the first one in Columbus and was a real inspiration to get involved beyond our own company building. From there we we’re off and running, building our new company Clearwish. A small group evolved out of Startup Weekend that was motivated to see more action happening and it’s continued since then. Why did you decide to lead Columbus Startup Week 2016? I was fortunate to be asked to be involved during 2015 and have the support of our great team. We believe we have a great community that is supporting and growing entrepreneurs from all types of backgrounds and want to be a part of events like Startup Week. It’s important to me to have entrepreneurs leading causes like Startup Week so they are aligned with the motivations and goals of the community. 2015 Startup Week surprised all of us that were involved in organizing it, not because it was well received, but because of how many people came out that had not previously been involved in the startup community. The week has elevated the need to bring together our community of entrepreneurs and broaden the reach of the message. The yearning for camaraderie and collaboration needed an opportunity to inspire and bring together people and the week provided that spark. Did Columbus Startup Week change the narrative for your startup community? The week changed the narrative from a niche to a real part of the fabric of our region. The event opened up doors and connectivity across organizations and groups to show we all have a common goal; progress. We have let the national ‘fly over’ conversation talk ourselves out of pumping our chest up about the strength of our entrepreneurs. We had a self realization of how much world class talent is located here in Columbus and its part of our story. Startup Week enabled a forced time to do a real assessment of what we are doing to build the community and how those efforts are going. Having this week on the calendar for an extended period of time provided those conversations in an environment that was open and welcome. We had a really good time too! The future is bright for Columbus entrepreneurs. The city is growing more than ever and new companies are the fabric of that growth. We have a generation of young people that want to build an identity here for themselves and Columbus. I wish I would have known how much the community was willing to give up their time and energy to lift up entrepreneurs. We also suspected it, but it’s hard to bring it to life. We expect to have an army of volunteers for 2016. Organizing is a big commitment of both time and energy, but it’s worth it. Organizing will provide you the ability to pull people out of their comfort zone and get them involved. One thing entrepreneurs are good at is asking for what they want. Startup Week organizing provides you the platform to make asks, so ask big! The Columbus Startup Week team is already planning their 2016 event. Make sure to follow along as they announce speakers and events for their second Startup Week!